Confessions: I have not read The Hobbit or Lord of the Rings BUT now that I've been warned, I will read LoTR first! Great review of both the book and movie girl! I have not read The Hobbit. I think I tried once as a teen and got bored. I am listening to it on audio but I'm not loving it, which is weird since its full cast. I am WAY excited to see the movie though! I'm hoping we can go this weekend. I'm so glad it wasn't a disappointment! Too bad you didn't like it! I loved it. I started it 3 times before this summer and never finished it, but for some reason I inhaled it this year. At first it was nothing serious, a bit childish, but after you plow through that it gets pretty interesting. I am going to see the movie tonight, I cannot wait! Although 3 hrs in the theater might be a bit too much. I am SUCH a picky kid; I really don't enjoy reading classical books, therefore I haven't read Lord of the Rings or The Hobbit yet. Actually, I think one of my elementary school teachers read part of The Hobbit to us, but I don't believe we ever finished it. I remember watching the old movie, though, and also recall that I was unimpressed. I'm sorry you didn't enjoy The Hobbit that much Keertana! It definitely seems like you have valid reasoning, since nothing sounds developed. But I'm so glad that the movie is fantastic! I've only heard gushing things about it, and can't wait to see it for myself. It definitely seems as if Peter Jackson blew some life into the characters and setting of the Hobbit. I can't wait to see it for myself! I am sure I read The Hobbit as a child but unlike the LOTR books, I don't have much memory of it, maybe that's because I found it boring too? In any case, I am always surprised when a film is as good or better than a book - it doesn't happen often, but when it does it's fantastic! I wasn't planning on seeing The Hobbit, but you can convinced me! See, this is where I went wrong. I started reading The Hobbit years ago and got about half way through, felt bored out of my brains and abandoned the Tolkien as an author, so it's clear that I need to try Lord of the Rings and not just give up on the guy if you say The Hobbit isn't nearly as good. Still, I will be going to watch the film (hopefully) as soon as I can, so I'm very pleased to hear you enjoyed it so much more and I know half the storyline, so hopefully I'll gather most of what's going off since it's so long since I watched TLotR that I fear all characters names and places will long ago have gone from my head. I want to argue that the movie and the novel worked in the same themes, feelings, and character growth. Because when I watched the movie all the things I felt while reading the book surged. But, instead I'm mentally lifting a finger and opening my mouth in protest only to close my mouth again because I can't be sure I'm remembering right. I read this book FIVE YEARS AGO. So. Moral of the story. There's only one thing left to do. Reread the copy I borrowed from the library to make my point. So I will do that. BUT I'M SO GLAD YOU LOVED THE MOVIE. I will be back. I read the Lord of the Rings trilogy, but I have not read The Hobbit. I think I'll stick with not reading it and go see the movie instead! I LOVED (okay, maybe OBSESSED over is more accurate) the LoTR movies, and I'm dying for another piece of Peter Jackson's brilliance. So glad to know you loved it Keertana! I definitely feel like I can understand where you're coming from on your thoughts about both the book and film. There are troubling aspects in the book, although I personally don't consider it to be dull. 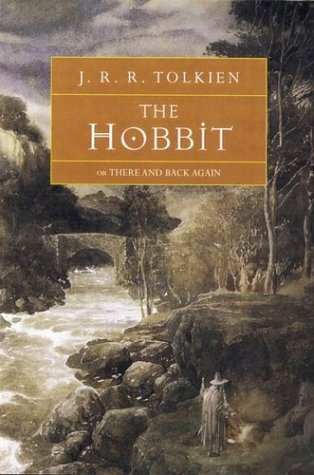 It's far simpler than The Lord of the Rings, but, when taking into consideration the intended audience and the fact that this book represented Tolkien's first exploration into Middle-earth, I think it works well. I did enjoy the film as well and for the most part approved of the changes made to the book, but not all. It became more epic for the big screen, but I wonder if it lost some of the sense of what The Hobbit is truly about in doing so. I plan on posting a film review as well, but I want to see the movie at least once more before attempting to do so! I haven't read any of Tolkien's novels but I've watched the Lord of the Rings movies and loved them. I usually watch them every year or so :) It's why I'm really excited about watching The Hobbit. So, it's good to know that you thought the movie was worthy of 5 stars. Hope you had a happy holidays, Keertana! Oh I love The Hobbit! I love it for its simplicity and the fact that it is a middle grade novel. I recently re-read it (after reading it as a young person actually in the middle grades) and was fortunate to read it alongside my 9-year-old, Greta. Perhaps this has put on my rosy-shaded glasses for the book, but I remember loving it before then. HOWEVER, I am a very gullible reader and have always enjoyed Elevensies. I haven't seen the movie yet and for some reason, I don't really feel like I want to rush out and see it. I think it is maybe that it is broken up into three movies and the book isn't that long, so my mind wants to rationalize that there is NO WAY the movie can stay true to the book so therefore I CAN'T POSSIBLY enjoy it. But I don't know. I AM curious, however, at what point of the book the movie ends. Like, where does it cut off so the next movie will begin? Or am I just wrong about the movie in general? I am under the impression they've made the relatively short Hobbit book into three full-length Peter Jackson movies. But, yeah, I absolutely adore The Hobbit and LoTR. I read The Hobbit when I was 8 and completely loved it which led me to read LOTR and the other writings of JRR Tolkien. I have not revisted the Hobbit book in adulthood but must say it sure was amazing when I first read it. Anyway, this is a great review, and I think I like your movie review even better. It shows how much more enthusiastic you were about the movie than the film, and I have to agree. I'm not that far into the book but I read it a couple years ago, and the dwarves don't have their own identities. I can never keep them apart, but in my mind I see the movie characters and that helps. Nevertheless, the book is a children's book and I love the simple humour it uses :) it reminds me a little bit of Roald Dahl. My favorite ivy league movies are Love story and the social networking. These are amazing movies and “Love story” is a romantic movie. Social networking is based on fonder of social website and their principles. I love to watch these movies any time.